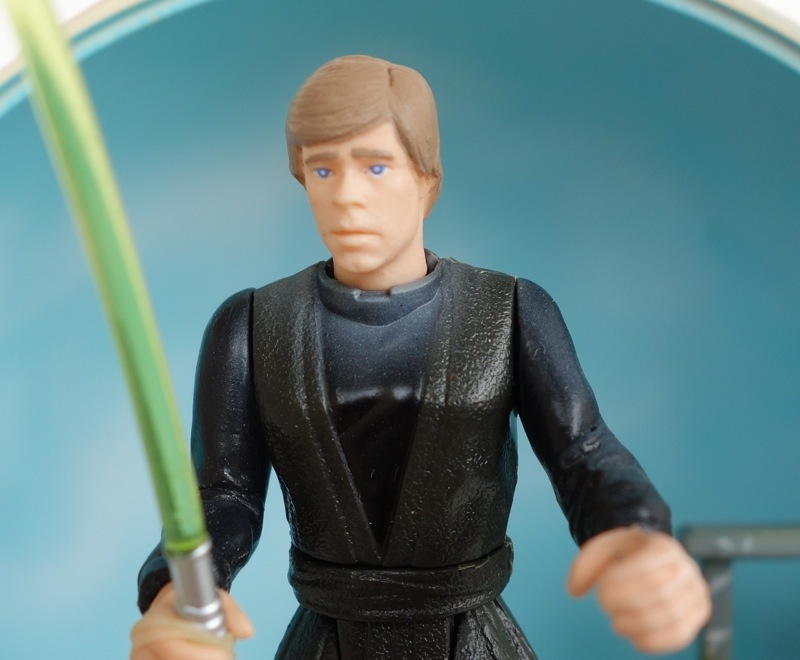 Although this was part of the “Kenner Collection” it was actually produced by Hasbro in 1998. 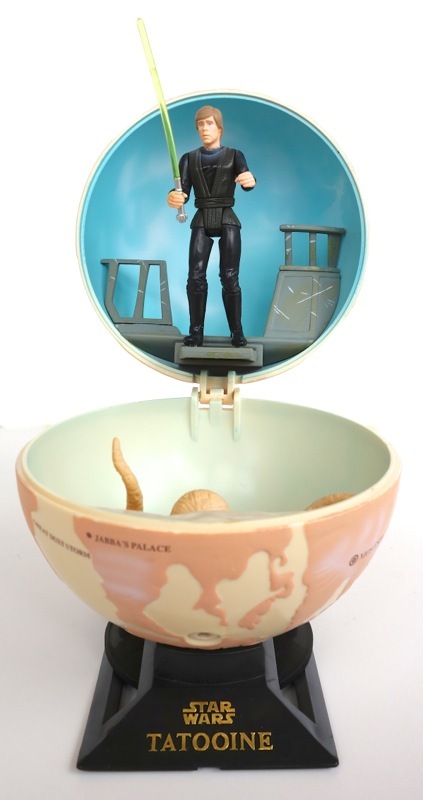 It was part of the “Complete Galaxy” line, which had figures paired with planet models that opened up to form little dioramas. Here we have Tatooine, and inside is Luke standing on the skiff above the sarlacc. I had never seen these in person before receiving this one, so I had originally though they were miniature figures, but it turns out that the figures are the same 3 3/4″ figures as in Hasbro’s main line, which makes the planets rather sizable — about the size of a large grapefruit. It comes with a stand to prevent it from rolling away. 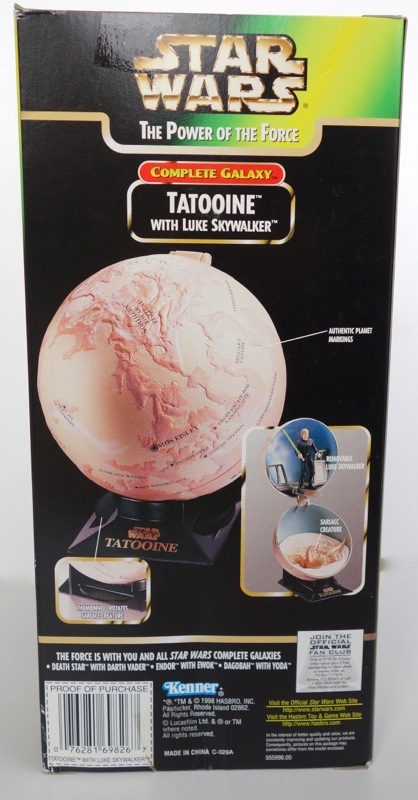 Mine had been left in the box for 15 years, so there was some discoloration of the planet’s paint where the plastic of the packaging touched it. Also, it refuses to close completely unless I hold my finger on it, which explains the shot below. 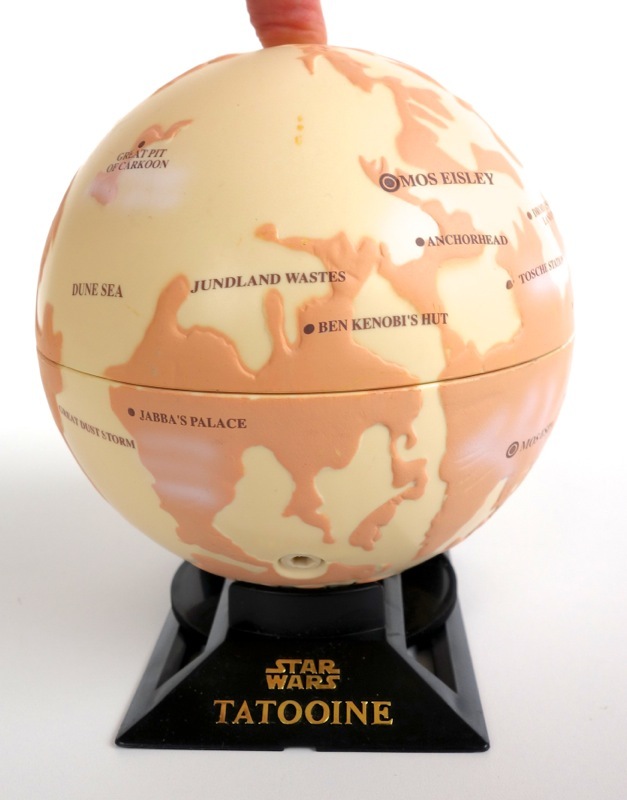 I had never given a lot of thought to the geography of Tatooine, but from this is seems as thought the main locations from the films are spread all over the entire planet. I’m not sure if Tatooine is just a small planet or if things like speeders are faster than I thought, but somehow that seemed odd to me, since they seem to be able to travel between locations relatively quickly. 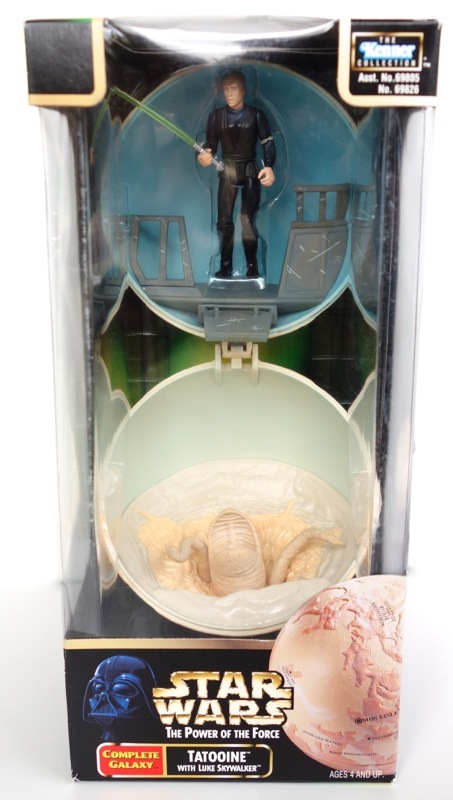 The Luke figure is similar to but slightly different from the one that came with the POTF2 Rancor (prototype here). His facial expression looks rather sad, or at least very concerned about something. I suppose I can’t blame him, as he’s about to be fed to the sarlacc, but it doesn’t really match the confident Luke we saw in the film. 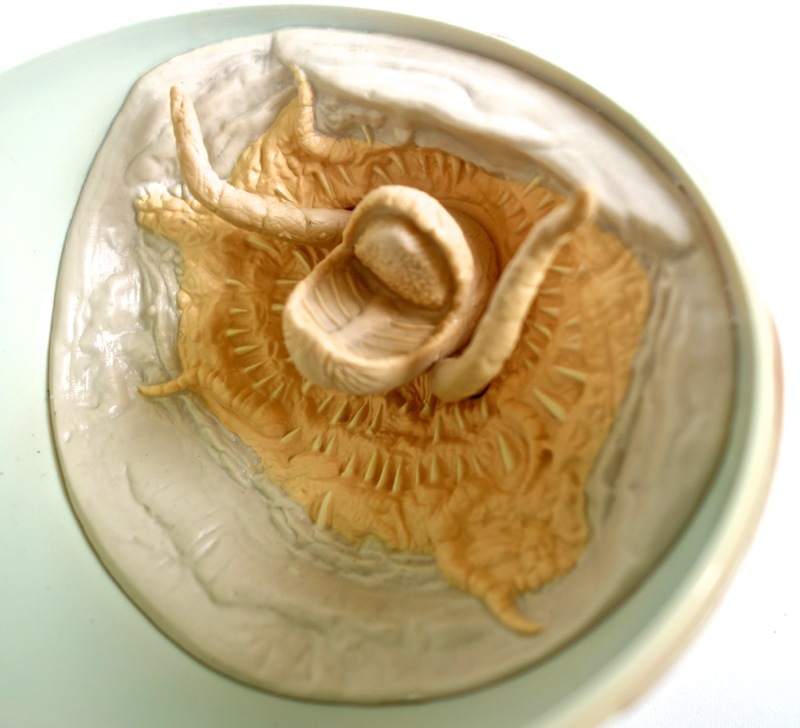 The sarlacc is of course the version from the “Special Edition” of Return of the Jedi, so it’s got that beak-like thing in the middle, but it’s sculpted well enough. The tentacles and mouth can turn.